The Ocean County Library connects people, builds community and transforms lives through the power of information and the power of stories. We are essential to our community today more than ever. Public libraries support lifelong learning, sustainable communities, and economic development. The library serves as a portal of knowledge and strengthens civic involvement. It increasingly provides content that is digital in nature, as well as supporting our residents’ desire for personal growth. 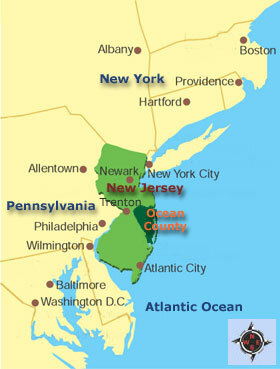 Ocean County Library is located at the beautiful New Jersey Shore, a major tourist destination on the East Coast near New York City and Philadelphia. We have 21 library locations to serve a population of 575,397 residents in the 32 municipalities that comprise our service area. Each year, the library circulates over 4.3 million books, answers over 2.5 million reference questions, provides over 11,500 programs and activities for children, young adults, adults and families, and has over 3 million visits to our library system. Our library collection includes over 1.3 million volumes and consists of print books, eBooks, audio books, magazines, music, DVD’s, videogames and local history materials. We have 76 databases providing access to thousands of journals, research and online learning materials. The library has over 494 computers available for public use and all of our library locations offer free web access via Wi-Fi. An Ocean County Library card may be used to borrow books and materials at any of our 21 library locations and to access eBooks and online resources either in the library, or from your personal computer with internet access, or through the My OCL app available for your smartphone, tablet or other handheld device. The Ocean County Library has a reciprocal borrowing agreement with the Burlington County Library and the Monmouth County Library systems which permit our residents to borrow materials from these fine library systems and permit residents of Burlington and Monmouth counties who belong to their county library system to borrow books and materials from the Ocean County Library. The Ocean County Library uphold the tenets of the American Library Association that all libraries are forums for information and ideas and the freedom to speak, to hear, to read and to view is protected by the First Amendment to the Constitution of the United States of America. We are a multicultural and inclusive institution dedicated to providing a welcoming environment to all regardless of age, class, gender, ethnicity, mental or physical ability, race, religion, sexual orientation or political affiliation. We respect, honor, and are committed to providing library services, materials and programs for all of Ocean County’s diverse populations. Recipient of the National Medal for Museum and Library Service from the Institute of Museum and Library Services in Washington, D.C. for demonstrating extraordinary and innovative approaches to public service, exceeding levels of community outreach and core programs generally associated with its services. The award was presented in 2007. Library Journal’s Library of the Year 2013 Special Mention recognizing Ocean County Library one of the top three libraries in the United States and Canada for our ability to demonstrate innovation and excellence for service and dedication to the community. The 2013 New Jersey Library Association’s Library Service Award for Trustees recognizing the Ocean County Library Commission. The award recognizes library boards, trustees and commissions for promoting the use of the library and developing recognition of its place in the community. Named one of America’s Star Libraries by Library Journal in 2010 and 2011.The LJ Index scores measure the levels of library service delivery relative to peer libraries nationally in the category of the $30 million and above expenditure group. Note that scores do not indicate the quality, effectiveness, or value of library services, nor whether the quantities of services provided sufficiently address community needs. Recipient of the American Library Association John Cotton Dana Library Public Relations Award in 2009 for “Hurricane Katrina--Partners in Caring.” In immediate response to the devastation, Ocean County Library raised funds to help restore services and support the Hancock County Library in Mississippi using a variety of creative methods and an aggressive public relations campaign. First Place in the American Library Association Diversity Fair in 2004 showcasing the extraordinary examples of diversity in America's libraries and "diversity-in-action" ideas. The Ocean County Library’s initiative involved three projects to provide library services for traditionally underserved Hispanic, African American, and Gay, Lesbian, Bisexual and Transgendered (GLBT) communities. We look forward to your visit to the Ocean County Library!